The scariest news a pet owner can hear is that their dog or cat is lost. Whether the gardener left the gate open, a child didn’t close the door all the way, or your pet escaped from a friend’s house while you were vacationing, the news of a missing family member sends a shock to your system. Some lost pets do make it back home and having an ID tag on your dog or cat is the best way to increase your chances of that happening. And unless you have a pet kangaroo, your furry family member does not have a pocket to carry ID, so his collar becomes his wallet. Reason #1: “I’ve had animals all my life and none have ever gotten out”. My response: No one plans for their pet to get loose. Unfortunately, unexpected things do happen. Reason #2: “I don’t like the noise the tag makes”. My Response: There are noiseless plastic tags, tag pouches, engraved plates that adhere to the collar rather than dangle, and even personalized collars with your contact number stitched right onto the fabric. Reason #3: I had just given my pet a bath that day. My Response: Put the collar right back on after the bath. Don’t wait! Make it part of your routine. Reason #4: My pet has a microchip. My Response: Microchips are an excellent way to keep track of your pet. However, the animal needs to be taken to a shelter or vet’s office where there is a scanner. Some people who find an animal don’t think to have it scanned for a chip. Make it easy for any Good Samaritan who might stop to help your animal by having an ID tag with all your current information. 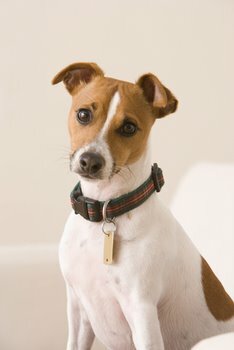 Microchip your pet to in case their collar falls off. When used in combination, microchips and ID tags are the best solution for keeping your pet safe. 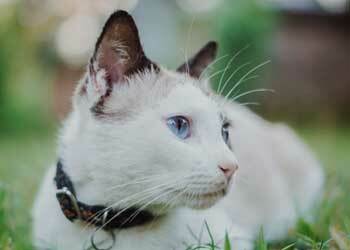 The reality is that your pet should wear a collar and ID tag most times of the day. An exception to this is when your pet is in a kennel, as the tag can get caught. Avoid this hazard by removing your pets collar when they enter their kennel. For cat owners, make sure your kitty has a break free collar. While the collar is important if your cat gets lost, it must be balanced with safety in case they get caught in a tree or other hazard. People sometimes say they don’t like to have a dog or cat’s collar on in their home. In the animal kingdom, when scary things happen, flight is often an animal’s first response. In the case of an emergency such as a fire or Earthquake, your pet could bolt or get loose in the ensuing confusion. Identification tags are the cheapest and easiest way to bring your pet back home quickly and safely. When our rescue group goes to the shelter to pull an animal we make sure to put a collar and tag on the animal before stepping outside the building. We highly recommend that if you adopt a new pet, you do the same, as coming to a new home is a particularly vulnerable time for any animal. New people and situations can be stressful for a pet. You don’t yet have a relationship with a dog or a cat who is new to the family. They don’t know to come when you call them. If they get out of your yard they are not familiar with their territory. Don’t wait to get a tag – have it before the animal comes home. We recommend the lightweight plastic tags that you can print on both sides. This type of tag is quiet, comes in bright, eye-catching colors, and won’t get scratched or worn like some metal tags. We also suggest putting your pet’s name, address and at least two phone numbers on the tag. Also the word “REWARD” might give anyone who finds your pet more of an incentive to return them to you. “Scan me for a chip” lets people know your animal is also microchipped and there might be additional contact information. This can serve as useful information for the individual that finds your pet, as knowing what to do when you find a lost pet isn’t always apparent. Remember, if you move or change your phone number, don’t forget to update your pet’s tag. It doesn’t do much good if the contact information is not current. If your pet ends up at a city shelter, you may have to pay impound fees to recover your pet. The time spent in a shelter can be extremely frightening for the lost animal as well. An ID tag is your best chance at preventing you or your pet from having to go through that. When I walk the kennels of our city and county shelters, I can’t help but wonder how many of these animals might have an owner. An owner that loves them, but wasn’t able to find their missing pet. What’s in your dog’s wallet? Note: Lisa Deanne Gilman is The Executive Director of The Rescue Train, a Los Angeles based, 501(c)3, nonprofit, no kill dog and cat rescue dedicated to eliminating animal suffering and euthanasia through hands on rescue work, education and awareness.